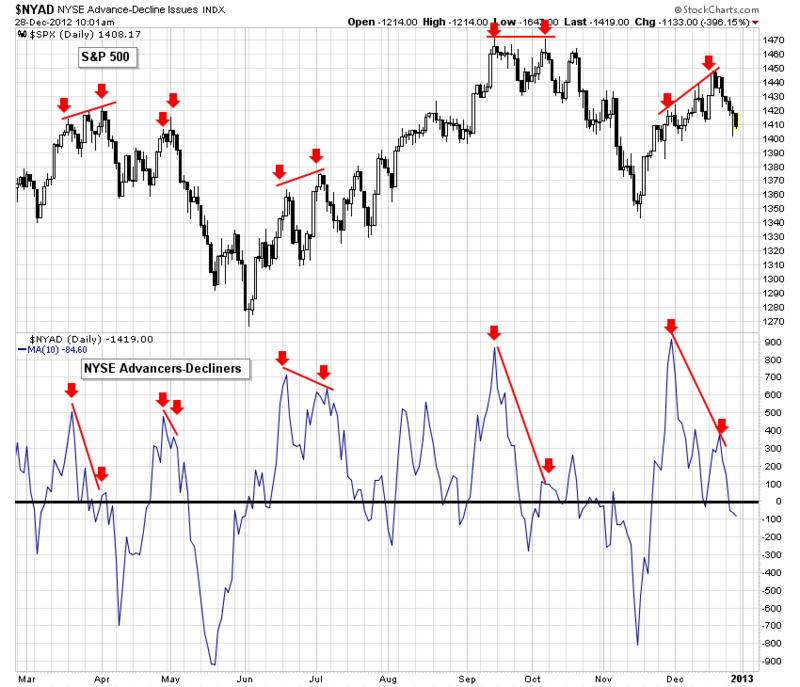 I posted this chart a couple weeks back in mid Dec before Christmas (see my post from Dec 19th) how there was an obvious negative divergence between the market S&P 500 and the NYAD NYSE Advance Decline issues indicator. As you can see from the history, this divergence has been a good predictor of market pullbacks - now obviously we have the Fiscal Cliff fiasco in Washington with our idiot politicians as a major new catalyst, however the chart was also setup for a pullback well ahead of this. On Sunday night, congress meets again for the Fiscal Cliff, let's see what the 'yahoo's do, obviously the market will likely gap one way or the other on Monday morning.